Following Daniel Aggar leaving the club to return to His hometown club Brondby Liverpool are left without a vice captain and the debate has started to find out who should fill the role. I believe that this time the appointment is more important than normal as current captain Steven Gerrard should be starting less games this year and will be looking to step down in the coming seasons giving the vice captain more and more responsibility as time goes on. So who should get the job and be in pole position to be the next captain of Liverpool. Firstly I think it should be somebody who understands the club and supporters so it needs to be someone who has been at the club for a while at least a season. Secondly they need to be a regular starter in the team, it's no good having a potential captain on the bench. Finally they need to have the personality and leadership ability to be able to command the respect of the other players and to lead our club. The above doesn't leave to many players as we can discount all the new players as they have just arrived. So who does fit the criteria. Simon Mignolet - I'm discounting Mignolet because it is rumoured that we are bringing in Valdes, if this is true there is no guarantee that he will have a starting place. Glen Johnson/Jose Enrique - These two can both no longer expect to be regular starters with the arrival of two new full backs and in the medium term I expect them to be leaving the club. Mamadou Sakho - Probably hasn't been around the club long enough and I'm not sure that Rodgers rates him. I do and I expect him to nail down a first team position but possibly has enough on his plate securing his first team role for now. Martin Skrtel - Not a bad shout but I expect Lovren and Sakho to be first choice defensive pairing leaving Skrtel on the bench and therefor out of the running. Raheem Sterling - Similar to Coutinho is without doubt going to be a world class footballer but a captain of Liverpool is not his style. Daniel Sturridge - Again not his style and I don't believe that strikers make good captains, he has plenty to worry about putting the ball in to the net without the added worry of leadership. So by my reckoning that leaves two players, Joe Allen and Jordan Henderson both of whom are excellent candidates. Allen has established himself in the team recently and looks like he will be around for a while and he is one of the managers favourites but is he a natural leader, I'm not sure. Having said that I'm not around the dressing room and don't know what goes on, I'm sure he has the respect of his colleagues as a player but is he a leader. Henderson on the other hand has all the above, he is a regular in the team, one of the first names on the team sheet. I hope he isn't going anywhere in the near future and should be around of years to come, he appears to be respected by team mates and the manager, often carrying messages from Rodgers on to the field and delivering them with authority. He plays in the centre of the pitch an ideal position for any captain and appears comfortable both taking the lead with other players and approaching the referee, he looks like a natural leader. 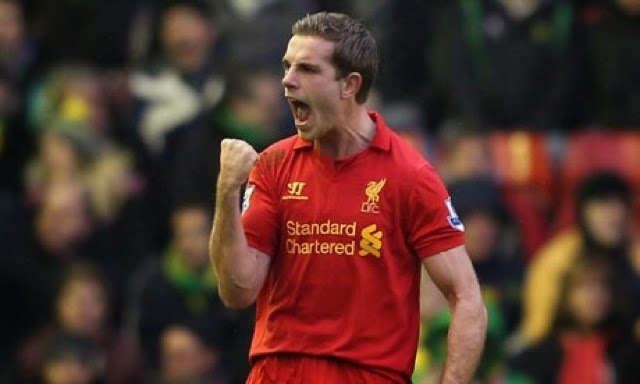 So for me there is only one real choice, so here's to you Jordan Henderson. In my opinion there is really only one choice, Henderson has grown with the team over the last couple of years, we have seen him taking charge on the pitch even, on occasion giving current captain Gerrard a tongue lashing. He certainly leads by example, every game showing a tremendous work ethic, he approaches referees when necessary and has thrown his weight around protecting other players when needed. The perfect vice captain for now and the perfect captain for the future.